Located on the People’s Square of Huangpu District, Shanghai Museum is a museum of ancient Chinese art. It was founded in 1952 on Nanjing Road. In 1959, it was moved into the former Zhonghui Building at 16s, Henan Road. In 1992, the Shanghai government allocated a piece of land on People’s Square to build a new museum and it became one of four famous museums in China. The new building has a round top and square base, which symbolize the ancient Chinese perception regarding the world, that is, “the sky is round and the earth square”. Overlooking from a distance, the museum looks like a piece of Chinese ancient bronze ware. With an area of more than half an acre (2,800 square meters), the museum is arranged by theme rather than by dynasties. The museum has five floors. A large souvenir shop on the ground floor sells museum replicas, books, postcards, paintings, calligraphy and so on. The main exhibition halls on the first floor include Ancient Chinese Bronze Hall and Ancient Chinese Sculpture Hall. Occupying an area of 1,200 square meters, Ancient Chinese Bronze Hall displays more than 400 bronze ware pieces from the 18th to 3rd century BCE which best reflect the history of ancient Chinese bronze art. The hall contains two outstanding wine vessels, one taking the shape of ox and the other a pot carved with pictures of a tiger, ox, leopard and Chinese dragon, which was used by the king of the State of Wu during the Spring and Autumn period. There are over 120 Buddha sculptures spanning from period of Warring States (403 – 221 BCE) to the Ming Dynasty (1271 – 1368 CE). The second floor has only one hall, Ancient Chinese Ceramic Hall. 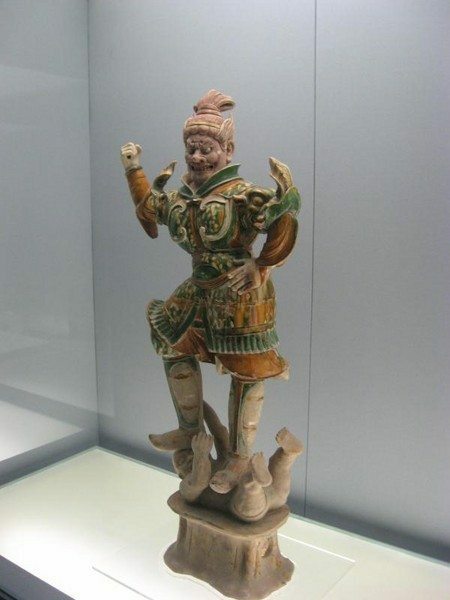 This hall contains about 500 ceramic articles including painted potteries and grey potteries in Neolithic Age, primitive celadon during the period of Spring and Autumn and Warring States, mature celadon in the East Han Dynasty (25 A.D – 220 A.D), tricolor figurines from Tang Dynasty and so on. The third floor contains Ancient Chinese Calligraphy Hall, Ancient Chinese Seal Hall and Ancient Chinese Painting Hall. The calligraphy hall collects typical masterpieces of calligraphy from different dynasties which explain the history of ancient Chinese calligraphy. In Ancient Chinese Seal Hall, you can see more than 500 seals from the Western Zhou Dynasty (1046 – 771 BCE) to the Qing Dynasty (1636 – 1912). These seals were used by emperors and their court to notarize documents in ancient China. Ancient Chinese Painting Hall displays the basic elements of calligraphy and Chinese paintings which explain the relationship between Chinese calligraphy and paintings. The forth floor has splendid Ancient Chinese Jade Hall where jade articles of all shapes, sizes and functions can be found. Ming and Qing Furniture Hall on the forth floor exhibits elaborately carved screens inlaid with jade from Qing Dynasty, a canopy bed and a folding wooden armchair from the Ming Dynasty. The forth floor also contains the Ancient Chinese Coin Hall which displays coins that predate the reign of the First Emperor of China (221 – 207 BCE), as well as a gold coin from Persia excavated on the Silk Road.